Each year enormous quantities of unused and expired medications are dumped into bins or flushed down toilets and sinks. The effects on the environment and human health are still unclear but evidence is pointing to the presence of chemicals from prescriptions and over-the-counter medications in soil, drinking water and the surrounding environment. Just as proper medication administration is important, so is safe and cautious disposal. After medications are dumped into the bin or flushed down the sink or toilet, they can make their way into the water supply and soil. Despite the chemical levels being low, this can still be sufficient enough to cause harmful effects on our health and the environment. The potential for these chemicals to end up in sources of drinking water is also cause for concern. Regularly go through your medicine cabinet and dispose of old drugs that you no longer take. Check expiry dates and immediately discard those with passed expiration dates. If you are uncertain whether a drug is still safe to take, check with your doctor or pharmacist. Don't automatically throw expired or unused medications into the garbage or down the sink or toilet. Some pharmacies have drug recycling programs so check with your local pharmacy to see if a program is in place. This allows for your medications to be disposed of in a more environmentally safe manner. Some medication bottles, particularly natural health supplements, can be recycled. Bottles will need to be cleaned and labels should usually be removed. You may be fortunate to find a location close to your home or it may be that you need to travel to a nearby town. Contact your local recycling depot for information on recycling empty bottles. Although mercury is useful in a thermometer, it is toxic to humans and wildlife. If your thermometer breaks and mercury is spilled, it will evaporate into the air and can be harmful to members of the household. Immediately following a thermometer break, it's important to open windows to allow for ventilation. You should wear gloves and pick up the mercury with an eyedropper, duct tape and heavy paper. Use several zipper bags to contain the mercury and glass waste, tightly sealing each of these, in turn. Even if you are simply disposing of an unbroken mercury bulb thermometer, it is still considered hazardous waste. Contact your local health department for instructions regarding disposal or unbroken and broken mercury thermometers. Always place breakable items into a safe and secure container before discarding. Broken glass or needles in a bin can still puncture your skin if you are reaching to throw out something else. It's especially important that you carefully dispose of breakables if children are in the household. 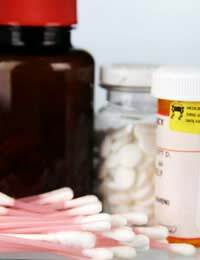 Your medications serve a valuable purpose in maintaining or restoring your health. By disposing of them safely and carefully, you can help to prevent contamination and destruction of the environment while keeping yourself and other household members safe from broken glass and hazardous waste.